Today I want to share another recipe gem from my grandma’s cookbook. It is SO easy, requires absolutely no baking and is delicious and refreshing. My grandma’s recipe called for Lemon Jello and lemon juice, but seeing as St. Patricks day is right around the corner, I decided to go the lime route for a fun “green” themed dessert. You can make it either way because both are equally as delicious. While jello is partially setting, In a large bowl, cream cream cheese and sugar together. Set aside. Make packet of Dream Whip up according to box directions. Mine called for ½ cup COLD milk and ½ tsp. vanilla. Follow directions and store in fridge until ready to use. Once jello is partially set, pour into cream cheese/sugar mixture bowl and beat to combine. Pour into graham cracker crust and sprinkle additional graham cracker crumbs over the top if desired. Cover and place in fridge until set. 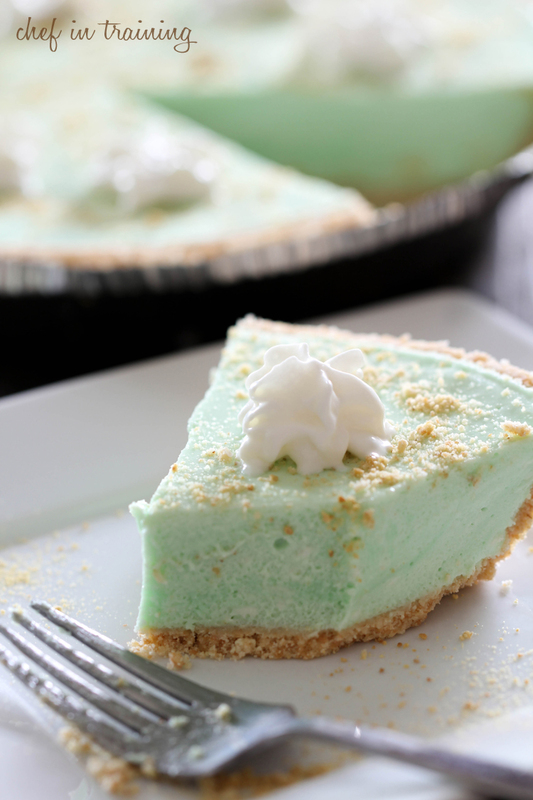 This reminds me of Key-Lime pie., (which is one of my favorites.) I love how easy it is, I am making this up for the weekend. I love your blog! Your pictures always have me drooling! I love sweet and tart! This will definitely be my next dessert! New to your blog and have tried several of your recipes already! My husband thanks you! Lol! I love it Nikki! This sounds wonderfully tart. And so many variations to be made! Love that this is your grandma's recipe! I like the color, it's a perfect pale green! I can see why your daughter loved this! i actually have a block of cream cheese that really needs to be used. problem solved! This might be a silly question but when a recipe calls for sugar, can I assume it's granulated? And is that what I need for this recipe...or powdered. Sounds yummy. Thanks for sharing. what is dream whip? can i use whipped cream instead? I bet this pie is cool and refreshing! The green is so apropriate for St. Patrick's Day or Easter!! I love seeing other people's family recipes! This looks so refreshing! I have not ever pegged myself as a lime person, but I tried some key lime cupcakes this week and they were absolutely to die for! I think I would love this! I'm still looking for my perfect birthday dessert next week...this is on the list! Look very delicious. Just wondering instead of dream whip of you could use whipping cream, whipped instead? Thanks for another fun recipe. This looks so good! 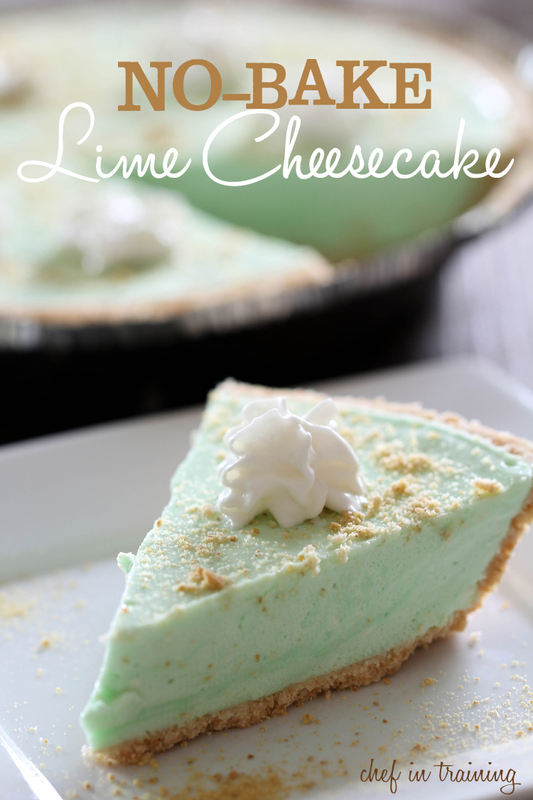 Key lime is my FAVORITE pie and to pair it with cheesecake is just perfect. I love how its no bake. Prefect for spring! This looks amazing! 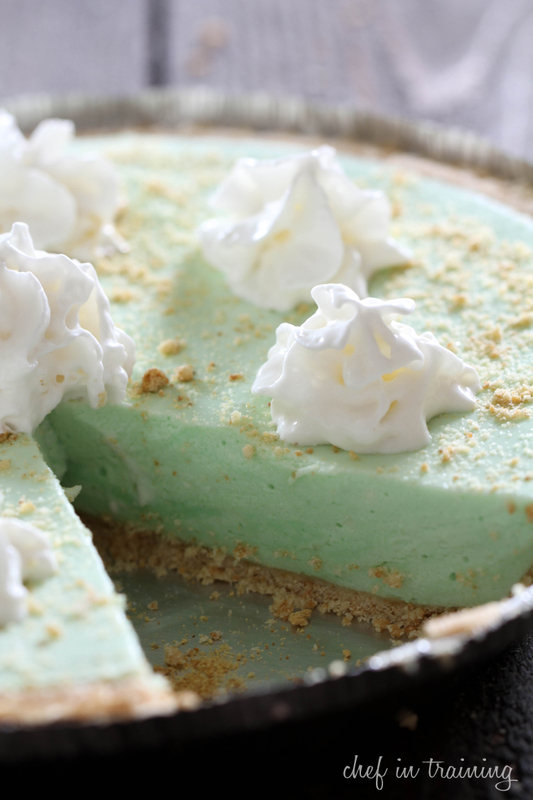 Key lime pie is so so fabulous! What is dream whip? And where do you find it? Thanks! It is a powder mix next to the Jello. There are 4 packets I believe per box. When prepared as the box states, I makes a whipped topping. Can I use cool whip instead of dream whip? Also, is it possible to use strawberry jello instead of lime or would I need some sort of liquid to replace the lime juice? Thank you for sharing this wonderful recipe! We loved it!! My husband said I definitely need to make this one again. I'm gonna make it for the fourth of july, but this time using strawberry jello and lemon juice. Hi! Saw your post on Pinterest, I made this and also blogged about it @ http://wp.me/p4lQhb-3Y! Extremely easy and very delicious! What is dreamwhip. We don't have it in Australia. What can I substitute it with?? I made this last night. Incredibly light and creamy texture with just enough tartness to keep it interesting. Definitely will be added to my favorites file. This looks really good and easy. Think of the other flavors you could use besides lemon and lime. Strawberry, raspberry,orange. This may be my go-to dessert for the summer. What is Dream Whip called in Australia? Is it just Instant Pudding? Sounds wonderful and as soon as I can I am going to try it. Question for you. Could you see if your grandmother has a recipe for Blueberry Coffeecake that has corn flake crumble on top. My Grandmother use to make this but since her death this recipe has disappeared from her recipe box. I simply loved it and it was simple to make. If you could check that would be wonderful. I used this recipe to make mini versions. I simply placed a vanilla wafer cookie in the bottom of cupcake liners and filled with the filling. It worked out great and was just as delicious! Thanks for the great recipe! Hi, this looks gorgeous but how long does this cheesecake last in the fridge and can it be frozen?? Hey! This looks almost identical to the one my grandma makes! Except, I don't know what dream whip is, so could I whip heavy cream and mix that in instead? How much cool whip or heavy whipped cream would I need? I don't know how much a packet of dream whip makes. Also I'm doing this sugar free and low carb, so I'm making the crust out of almond meal and using sf jello. That's why I want to use heavy cream. Thanks! I live in New Zealand can you give tell me what Dream Whip is, we don't have that here. Is there a substitute for it. Looks so refreshing perfect for a ho summer day treat . Answer, to statement above is, that Jello , is the number one Mormon desert ! It feeds a lot, and keeps well, on the way to church suppers ! can you use gelatin instead of jello? What's the difference? Nikki, I tried this recipe, and it's the best lime cheesecake I've ever tasted. I was a little concerned at how runny the filling seemed, but it set up perfectly! The texture and the taste are fantastic. Thank you so much for sharing!